The quiz will be conducted by Mario Fernando & Ramprasad Narayanasamy. Be there for the inquisition!! 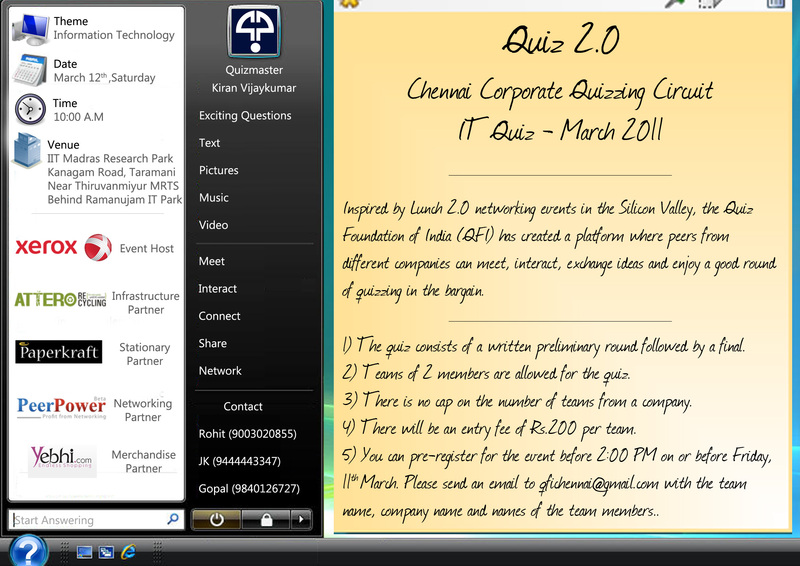 Please refer the attached file for the details of the upcoming edition of Quiz 2.0. We are looking forward to your participation. 1) The quiz consists of a written preliminary round followed by a final round. Attractive Prizes. 2) Teams of 2 members (can be from different companies) are allowed for the quiz. 3) There will be an entry fee of Rs. 200/- per team to cover the organization cost. 4) You can pre-register for the event before 2:00 pm on Friday, 11th March. The quiz will be conducted by Mario Fernando & Rohit Suresh. several quizzes-the latest being the Open quiz in Coimbatore last week.